The researchers are collaborating on a project funded by the National Institutes of Health that is attempting to create a non-invasive diagnostic tool for pregnancy abnormalities, reducing the need for amniocentesis. During pregnancy, vesicles are released from the placenta into the mother's blood stream. In addition to biological markers, the physical properties of these vesicles, such as their size, rigidity and viscosity, also may hold clues to potential complications of pregnancy, including fetal growth restriction and other placental disorders. The Magee researchers, led by Yoel Sadovsky, are collecting experimental data on vesicles, and are characterizing their biological and biochemical properties and cargo. The Carnegie Mellon engineers, including Subra Suresh, K. Jimmy Hsia, David Quinn and Changjin Huang, are exploring new ways in which an understanding of the vesicles' basic biophysical properties can be used to develop better clinical practices and outcomes. "Developing a comprehensive framework of how vesicles form, using fundamental principles of science and engineering, has the potential to suggest new approaches to diagnostics and therapeutics for human diseases, " said Suresh, president of Carnegie Mellon and a co-author of the research. "This study provides a quantitative understanding of the conditions under which vesicles form, which may not only help in the design of synthetic drug delivery devices, but also provide insights into how the physical characteristics of vesicles could be altered by diseases." In biological systems, vesicles bring material in and out of the cell. They are formed when a lipid bilayer membrane folds in to create a container around the material that is being transported. The vesicle's properties, including its size and viscosity, may change in response to disease. To understand the interconnection between a vesicle's size, structure and properties, the researchers looked at the basic thermodynamics and energetics that drive vesicle formation. Experimental results from the Magee team suggest that some of the most interesting and useful biological cargo of vesicles may be contained in exosomes, the smallest of three major vesicle types, with diameters of approximately 100 nanometers. The Carnegie Mellon team found that the folding process in these smallest vesicles is highly nonlinear. 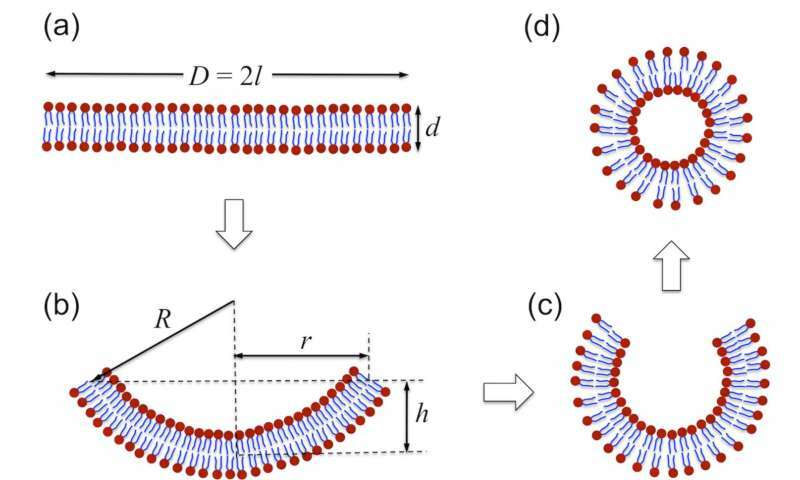 The researchers then used nonlinear mechanics and thermodynamics to establish connections between the lipid structure, curvature and resulting vesicle size and shape. "Gaining this fundamental level of understanding allows us to see if there is a correlation between the biophysical properties and the structures of the vesicles," said Hsia, a professor of biomedical and mechanical engineering at Carnegie Mellon. "From there we can begin to derive what's going on in the system and associate the changes with disease states." This heightened understanding of vesicles' biophysical properties means that researchers potentially can use new cell separating technologies to remove vesicles from a simple blood sample. Such technologies, like an acoustic cell sorting device being developed by a collaboration between Carnegie Mellon, the Massachusetts Institute of Technology and Duke University, are considered "liquid biopsies" and offer a non-invasive alternative to traditional biopsy techniques. "Our discoveries shed new light on vesicle-based non-hormonal communication among tissues," said Sadovsky, director of the Magee-Womens Research Institute. "Harnessing the power of engineering tools will allow researchers to design new, non-invasive diagnostic tools that can change our definition of health and wellness during pregnancy and other periods of human development."